The four piece band currently on tour with Born Ruffians play a confident set. Their first few songs drive and push, but they push on in the same way and you start to feel that all the songs sound the same. They do however steal the set back with the last two songs, ‘Got What You Need’, is a more messy, garage track with a great bass line and with vocals that fall rather than fight with the guitar melodies, It just feels more at ease with its sound and is a little less clean cut. ‘Authentic’, their final song is playful and catchy and above all, different. The vocal line has great direction, pace and rhythm which snakes round the bass part. It was a shame that they didn’t put these numbers in and amongst to break up the set a bit. 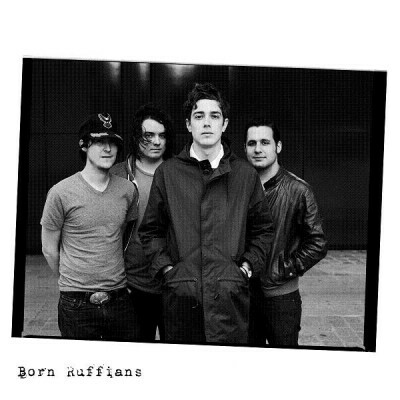 Born Ruffians made their move onto the scene in 2007. Their first album ‘Red Yellow and Blue, was a concoction of lolloping bass lines, thriving guitars and vocals from Luke LaLonde that reminded us that style and distinction certainly make a stand. Their second ‘Say I’, relies on sparser sounds, more natural direction, but with less immediacy. The start of their set to say the least is rather tense, LaLonde’s vocals sound weak and his top range sounds restrained, it’s as if hes had too many cigerettes with his innocence bled. Although this is disproved by the next song and his voice sounds full, jittery and alive. LaLonde’s ability to syncopate so many words in, ‘Barnacle Goose’ is rather impressive and their quirky juxtapositions are tight, the jolty persistent drums of Steve Hamelin act like a glue to the song. They also have the ability as a band to sound three times bigger than they actually are, the songs sometimes feel so busy and full bodied that you’re surprised to see only four band members. It was interesting that ‘In a Mirror’, was changed for the ease of LaLonde’s vocals. His usual volatile changes in pitch were ironed flat, ‘In a Mirror I can see her,’ was treated to a single tone. It worked though as he appeared more interested in the deliverance of the words rather than its flippant melody. It’s refreshing anyway that they feel comfortable to take away some of the recordings polished shine; they keep tight and crisp without being overtly clinical. They end their set with Kurt Vonnegut, a song I consider to be one of their strongest as it allows you to see a different side to the band. The drums are heavy and the driving guitars are favoured to a more sinister key. The succinct changes ring out and are pretty and unafraid to pull against the strict time. Even the vocals take a more different colour; desperation is present making his voice stronger. It is a gig to be remembered, the crowd are particularly lively and at times I think the band are amused by this as they appear to be grinning a lot and looking knowingly at each other.